Local elected officials are calling on the city to come up with a more comprehensive plan on its intended use for a block where a planned sanitation garage is to be built. More details, they’re saying, are needed about what the east and west parcels of the property on the current Hunter College Brookdale campus, would be used for, as well as other factors. Only the center area is slated to be used for the garage. This comes after a tour was held last Wednesday of an existing garage facility on 57th Street in an attempt by the Department of Sanitation to answer questions about the one intended for 25th Street and First Avenue. The tour was attended by Council Member Dan Garodnick, Assembly Member Brian Kavanagh and representatives for State Senator Brad Hoylman and Congresswoman Carolyn Maloney, as well as a few community leaders. Janet Handal, president of the Waterside Tenants Association, was present, as was the property’s general manager, Peter Davis, and 23rd Street resident Gerard Schriffen, president of a group called the Rose Hill Community Association. 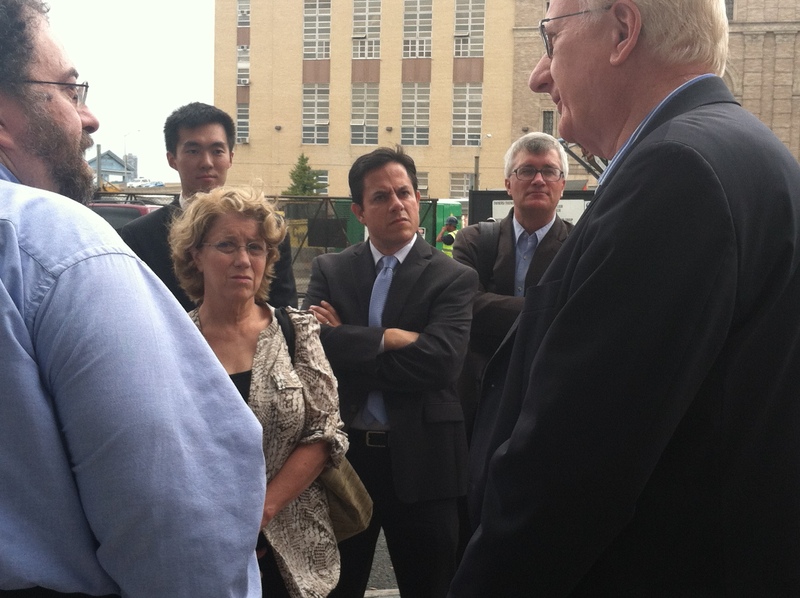 Leading the tour at the 57th Street facility was Dan Klein, director of real estate for DSNY. Following the tour, Kavanagh and Garodnick echoed concerns previously made by community residents about the Brookdale facility plan, which was first announced close to a year ago, being sped along to get necessary approvals while Mayor Bloomberg is still in office. The city announced the plan as part of a land swap that would give Hunter property on 73rd Street for a new school and medical facility to be built in collaboration with Memorial Sloan Kettering. He added that he thought the discussion should continue as it has been at Community Board 6 meetings. The last public meeting on the subject was held in late June and an extended public comment period ended on August 14. In response to a question from a reporter of whether the DSNY would delay its ULURP request, Belinda Mager, a spokesperson for the department, indicated it wouldn’t. The department has said previously the west and east sides could be leased out by the city to private developers. Meanwhile, the lack of available information on the plans for the east and west parcels has led at least one neighborhood resident, Schriffen, to draw his own conclusions — that the city will be using one side to store fuel tanks, the other for a salt shed. The DSNY has however said that while there will be fuel storage onsite, there won’t be a salt shed. As for a salt shed, he said he was opposed to that use for the property as well as the storage of diesel fuel due to the dangerous chemicals that are found in both. To store the fuel tanks, Schriffen said he was told on the tour that there would be a berm made of pebbles with a concrete lid. Handal said it was explained that it would be placed below ground but appear to be above ground inside and “above the flood plain.” She added that she’s been asking for a drawing of the plan since she and others on the tour found the explanation confusing. On the tour, Sanitation reps noted that there were vents in the garage for pumping out fumes for the safety of people in the building, but Schriffen, who lives on East 23rd Street, later said he wondered about the safety of the surrounding community. Other area residents have also expressed concern about the presence of onsite diesel fuel tanks at the garage and how they would affect security and air quality. Additional concerns have been raised about traffic on the surrounding streets due to sanitation trucks competing for space with V.A. and Bellevue hospital ambulances, odors from garbage emanating from the site and excess noise once construction begins. Handal said she was particularly concerned about traffic congestion around the facility since Waterside Plaza, which is located right across the FDR Drive from the site, has two onsite schools. Additionally, a nearby street, Asser Levy Place, is eventually going to be closed to traffic following the Asser Levy Playground’s planned expansion. “They say they’ve done traffic studies already, but I want to see copies of those because they need to do that during the school year,” said Handal. Area residents have also been vocal about their opposition to the garage based on the fact that such a facility is completely inconsistent with the rest of First Avenue in the East 20s and some of the 30s, now a corridor housing three hospitals as well as numerous other medical and science-related facilities.